Remember how Australians used to dream about Greg Norman going head-to-head with Tiger Woods? The trouble was, the Shark [Norman] was nearing the end of his career and Tiger was just beginning to climb his mountain. Now the boot is on the other foot and it’s Woods who looks to be winding down. 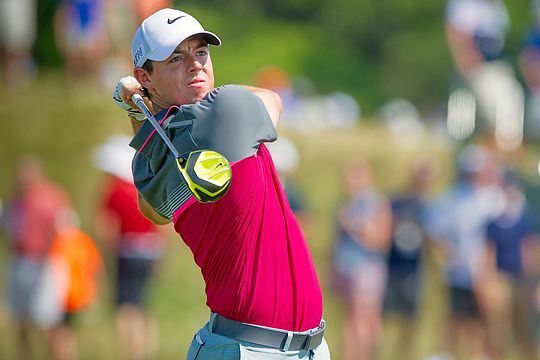 Even so there is a young man named Rory McIlroy, rapidly making a name for himself as the “next” Woods, who also dreams of taking on Tiger. Only this time Rory is the hunter and Tiger is, well, the hunted. McIlroy last week admitted he had not given up hope of achieving a lifelong ambition of going head-to-head with Tiger down the stretch of one of the four major championships. Mind you, it’s been eight long years since Woods’ last major win; just a year after Rory joined the professional ranks. Now 40, Woods has not figured in any of McIlroy’s four major championships as he has battled injury and his own off-course dramas since that last major success. “Hopefully if he [Tiger] can get healthy, I would still love to have a crack at him down the stretch in a major,” explained McIlroy, who is now ranked the No 2 player in the world behind Jordan Spieth. “I would love that, just once,” said McIlroy. Of course Woods is currently consigned to playing video games as he recovers from his third back operation in just 19 months. He hasn’t been able to put a time frame on when he might return to the PGA Tour. But when he does, Rory will be waiting for him and yearning the chance to go head-to-head in the final round of a major with the former world No 1. It might be a cliché, but the fans will certainly be the biggest winners if it ever happens.